At long, long last, your ship is pulling into port and docking for the weekend, and you're long overdue for some sweet (and much needed) shore leave. The only problem is that you're tired of wearing your greasy service uniform, and dress whites just aren't appropriate for the kind of merry-making you have in mind. Sure, civies are an option, but you know what they say about a man in uniform... so it's obvious everyone needs to see that you're a seafaring man. 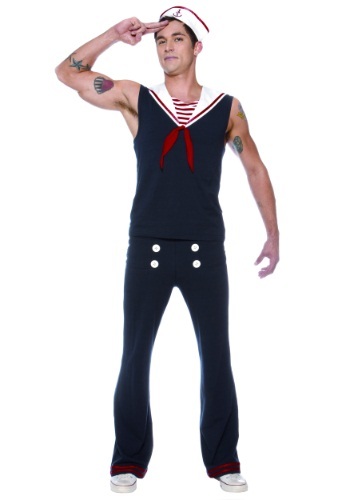 Well, good news ahoy, sailor: we have the perfect uniform for you. The Men's Plus Size Deckhand Sailor Costume is the ideal set of duds for the ultimate Halloween voyage! Consisting of a set of bell bottom-style pants (you can tell all your friends that the bell bottom fad actually originated with the styles used by the Navy -- take that, hippies! ), a sleeveless shirt with a wide "flap" collar and red bow, and (of course) a hat with the iconic anchor symbol, this costume flawlessly captures that classic "sailor" look... with a chic and modern twist. It allows you to show off those massive anti-aircraft guns of yours (which you normally have to cover up with more conservative long-sleeved uniforms), without having to sacrifice that all-American vibe you'll be giving off on the big night. And naturally, the uniform is navy blue. With the Men's Plus Size Deckhand Sailor Costume, your next shore leave (i.e. epic Halloween party) is sure to be one for the ages!